A woman has been murdered in an act of cannibalism and the suspect has died after Gwent Police fired a Taser at him. 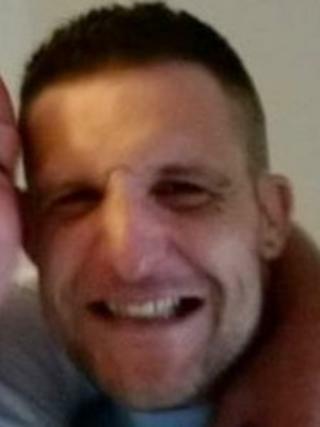 Officers went to the former Sirhowy Arms Hotel in Argoed, Blackwood, at 01:23 GMT where it was reported Matthew Williams was attacking the woman. The 22-year-old's death is being treated as murder, the force said. It confirmed officers fired a Taser at Williams, 34, who was then arrested but later died. The matter has been referred to the police watchdog, the Independent Police Complaints Commission (IPCC), which confirmed it is investigating. The police force said Williams was local to the area and the woman was from Blackwood. It added it was not looking for anyone else in connection with the incident. It is believed the two were in a relationship. Forensics experts dressed in white head-to-toe overalls, were combing the area for clues on Thursday while residents watched on the other side of the police cordon. June Trace, secretary of Argoed Baptist Chapel, which is next door to the hostel, said the Sirhowy Arms had been converted into accommodation for vulnerable people several years ago. Mrs Trace said: "It's a real shock." She told BBC Wales that the building had a "fluctuating population" of people, often aged in their 30s or 40s, who would stay there for a time before moving on. She said there had been concern in the village when plans were put forward to convert the building, but she added: "There's never been any trouble or anything." The chapel hall, which is next to the hostel, has been opened for police use during the investigation. Councillor Leon Gardiner said villagers had been talking about the incident. "What has happened has hit the community for six, knocked the stuffing out of the village," he said. "I have lived here all my life - 80-odd years. I feel very upset about this." Some villagers said there had previously been trouble at the hostel. Susan Gibbs, 71, said: "Police seem to be here every other night to sort out the violence. "We've even had people sleeping rough overnight in the hedgerows." Another villager added: "The village didn't want the halfway house. There's quite a lot of elderly people here and they were all against it. It started up about two years ago." A spokesman for Caerphilly council confirmed the hotel is used as temporary accommodation for homeless people. In a statement the spokesman said: "The authority is fully co-operating with Gwent Police as part of their ongoing investigations."